An Ambulance in GTA III. 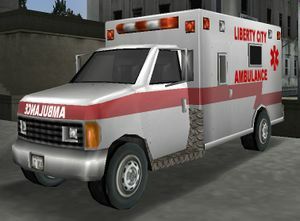 The Ambulance is an emergency vehicle that has appeared in every game in the series, except Grand Theft Auto 2, where it is known as the Medicar. Ambulances are usually found near hospitals and, in Grand Theft Auto III-era games, can be used to start the paramedic sub-mission. The vehicle is invariably a van or truck-based emergency vehicle featuring red and white lights and sirens and a matching paint scheme (with the exception of GTA 1's Ambulance in Vice City, which features a green-white paint scheme) and complete with it's letters on backwards. Throughout the series the siren sound has varied slightly, as has the design of the vehicle itself. If the player decides to go on a killing spree and many pedestrians are killed, an ambulance will arrive and two paramedics will get out and attempt to revive the wounded. Typically if paramedics are killed it creates more police attention than other civilians. In all games between GTA III and GTA Vice City Stories, the player receives 20 points of health upon entering an Ambulance. In Grand Theft Auto IV, the player can even dial 911 to summon an Ambulance, from which the player can replenish their health for a price, or steal to regain some, but not all, of their health. Ambulances in GTA 1 and GTA III through to GTA Vice City Stories are based on various generations of the Ford E-Series chassis, mainly the third and fourth generations, while the GTA London rendition is based on a European or British model, although given its angle, the vehicle's origins is unknown. Furthermore, the sound of the siren on each vehicle is distinct. Although the Ambulance in GTA IV sports a "Brute" badge on the front, it is clearly a modified version of the Declasse Burrito. Ambulances in GTA V appears mostly identical to its GTA IV rendition with minor cosmetic improvements (such as additional front quarter turn signals and newer light bars), but are also available with different liveries, including a Los Santos Fire Department variant. Grand Theft Auto 1 rendition; Liberty City. GTA 1 rendition; San Andreas. GTA 1 rendition; Vice City. Grand Theft Auto: London 1961 and Grand Theft Auto: London 1969 rendition. Grand Theft Auto III rendition (Rear quarter view). Grand Theft Auto: Vice City rendition (Rear quarter view). Grand Theft Auto: San Andreas rendition (Rear quarter view). Grand Theft Auto Advance rendition. Grand Theft Auto: Liberty City Stories rendition (Rear quarter view). Grand Theft Auto: Vice City Stories rendition (Rear quarter view). Grand Theft Auto IV rendition; the bullbar mounted in the front is an optional accessory (Rear quarter view). GTA V rendition, "Los Santos Medical Center" variant (Rear quarter view). GTA V rendition, "Mission Row San Andreas" variant (Rear quarter view). GTA V rendition, Los Santos Fire Department variant (Rear quarter view). Handling-wise, the Ambulance was originally average in GTA 1, GTA London 1969 and GTA London 1961, featuring good acceleration and grip but average top speed, braking and handling. Their base export value in GTA 1 and GTA London 1969 and GTA London 1961 is also considerably high: $1,400 in GTA 1 and £900 in GTA London 1969 and GTA London 1961; however, the vehicle, like other emergency vehicles, cannot be exported. From GTA III onwards, the Ambulance is fairly fast for its class and has decent brakes, but is very top heavy and unstable, making it prone to rolling over under rough cornering. In GTA IV the Ambulance has a diesel engine which is very loud when the Ambulance is idling. The Paramedic side-mission can be toggled on or off when driving the ambulance in all GTA III-era games. This mission requires the player to find, pick up and deliver patients to the hospital within a time limit, while endeavoring to drive as safely as possible (each bump further injures the passengers). With every level comes another patient to deliver, increasing the difficulty. Usually when the player beats level 12 the mission is complete (but can be carried on and replayed later) and a reward is achieved, e.g. infinite sprint or extra health. 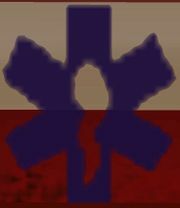 Closeup of the altered Star of Life on the GTA San Andreas Ambulance. Ambulances featured between GTA III and GTA Vice City Stories feature a slightly altered "Star of Life", with a sperm in place of the "Rod of Asclepius" symbol. This may have been used because the Rod of Asclepius is copyrighted. In GTA IV, this is removed and is left blank, though the real-life Star of Life with the Rod of Asclepius can be seen on the Paramedic's uniform in GTA IV. In Grand Theft Auto IV Ambulance's lights reflect on the ground as red and blue but there are only red and white lights on the truck. In GTA IV, cops will shoot at the ambulance if they hit a pedestrian or police officer in the vehicle. In GTA IV an ambulance can be seen driving around with only the lights on, making it possible for the player to drive if the driver is shot. Once in the ambulance, the player can use the air-horn with the lights on. In GTA Vice City Stories, when turning on the sirens on while performing a Unique Stunt Jump, a special siren can be heard. In GTA IV, if someone is lying on the floor wounded and you call an ambulance, when it turns up and the paramedic will get out and say "OK, where's the patient." in clear view of him/her. He will then get back in the ambulance and it will leave. In GTA IV, the rear wheels have a wider tire width, although they leave a dual tire mark, much like a dually tire would, this also applies with the Firetruck. In GTA III, the ambulance siren is based on the sirens in England rather than the United States, though in the rest of the games the sirens are of course based on American sirens. In GTA V some ambulances have the acronym MRSA, a reference to the MRSA virus. In all its appearances, Ambulances, as mentioned, will be driven towards where multiple pedestrians are killed (by either the player or NPCs). In most games, Ambulances may also be found within hospital ground, which is listed below. Ambulances can be obtained by dialling 911 and choosing ambulance by dialing 2. Medicar, a car-based variant in GTA 2. This page was last modified on 28 November 2014, at 08:57.